America’s founders recognized that without a king, the fledgling nation would need an informed citizenry—or their bold experiment in democracy would fail. So in early America, the government subsidized newspapers, established the postal system to facilitate information flow and drew up plans for public education. But now in the digital age, does the demise of newspapers threaten citizens’ access to quality journalistic information? 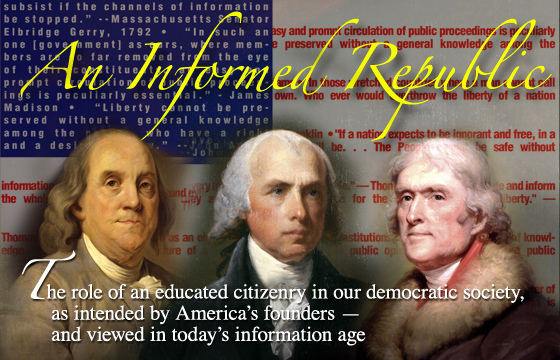 Does remarkably low civic knowledge by average Americans weaken the fabric of democracy? This new one-hour Humankind documentary features retired Supreme Court justice Sandra Day O’Connor, Pulitzer Prize-winning historians Gordon Wood and Annette Gordon-Reed, new media analyst Robert McChesney, voices of tourists at the Newseum, and others.